Always a great magazine and I often wonder how a few contributors team up to provide the quality we as readers get each month. I was very (excited) pleased to see the excellent photo showing Malaysia and Austasia in the centerfold in such superb clarity. 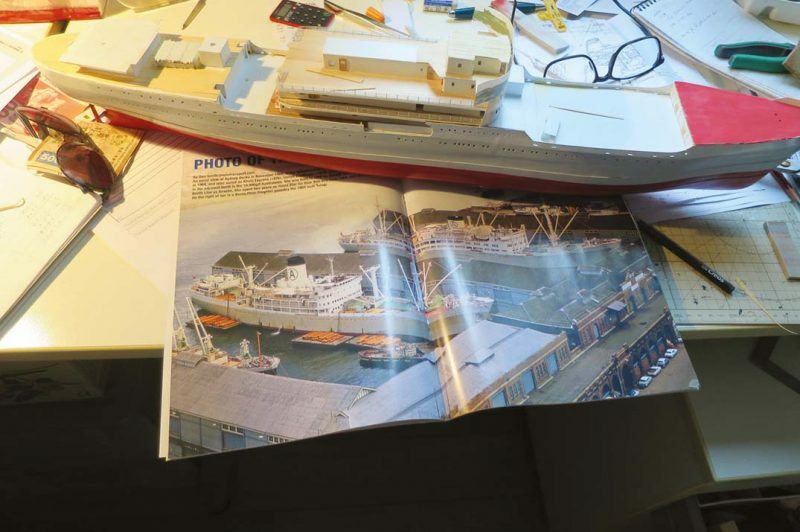 As I am currently building a 1:200 scratch built static model of Malaysia I was very pleased to get another view which really shows the decks in detail. Shame I just finished planking the poop as I couldn’t decide from the plans just how far back the wooden decking extended. Anyway, its all the better I have this exquisite photo to work with. So much useful detail. So far working with plans and magnifier of black and white. Great magazine. The giant 210,678gt container shipMOLTribute made her debut call at Southampton on 27th August on her maiden voyage. She is seen here berthed at SCTS on 29th August. The 20, 146 TEU vessel came into service on 10th July after being built by Samsung Heavy Industries in South Korea. 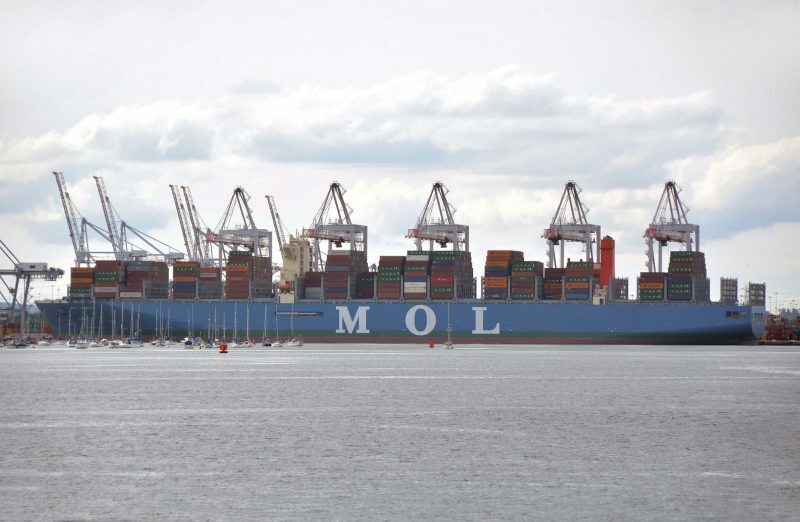 After leaving Southampton she sailed to Hamburg where, on 1st September, she had to drop an anchor in emergency to avoid collision with other vessels while docking at HHLA Container Terminal Burchardka. Having read Forgotten Fleetsabout Hansa Line it was sad to see a premier Heavy Lift company go bust, particularlywhen it had the edge over there rivals with they used of the Stulcken derricks. I could not understand why such British Heavy Lift companies eg ED, Ellerman, Royal Mail, Port and Clan Line did not adopt the Stulcken but stuck with the out dated traditional Jumbo derrick style.The Clan Line (S&C) came close to this with the Good Hope Castle and Southampton Castle with Hallen derricks and not even Norwegian Capt. Smith who was the father of the Heavy Lift with his ‘Bel’ ships. A lot of British traditional liner companies saw its potential and adopted this method to carry containers. With regards to Norman Middlemiss’s feature on Pll, he forgot to mention the Australia Star. renamed Anro Fremantle, was initially chartered to PIL then later owned by them and renamed Sea Express. David Eeles’ article was of interest to me, since I remember the Southern Harvester well although its over sixty years ago, She used to visit Tilbury Cargo Jetty once a year on her return from the South Atlantic. She would discharge the products produced from the whales, I believe one of the products was whale meal. My late father was a crane driver and worked on the discharge and I remember him tell me, how much they smelled. Whilst the crew spent much time at sea again its a long time ago but I think it was about six months. I can remember him bringing me home a sperm whale tooth mounted on a wooden plinth. The other Salvesen ship that used to call was the Southern Opal which used to bring in whale oil, that was taken up to Purfleet for use in making margarine. The feature article about Tuillier was very interesting but I found one of the photographs taken by Rowley Weeks particularly interesting, since I remember him from my days watching ships off Dover.